Hagerman horses (Equus simplicidens), also called the Hagerman zebras or the American zebras, were a North American species of equine from the Pliocene epoch and the Pleistocene epoch. 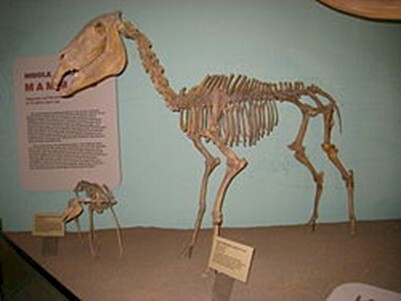 It is one of the oldest horses of the genus Eqius and was discovered in 1928 in Hagerman, Idaho - it is the state fossil of Idaho. Hagerman horses first appeared about 3.5 million years ago. They were approximately 110–145 centimeters (43–57 inches) tall at the shoulder. They weighed between 110 and 385 kilograms (243 and 849 pounds). An average Hagerman horse was about the same size as an Arabian horse. They also were relatively stocky with a straight shoulder and thick neck, like a zebra, and a short, narrow, donkey-like skull. Hagerman horses probably lived in grasslands and floodplains, which is what Hagerman, ID, was like 4-3 million years ago. Native North American horses became extinct about 10,000 years ago, at the same time as many other large-bodied species of the period.